I found this most excellent essay while browsing the web one day. It examines the philosophies of Free Software from several different directions, but primarily from the intellectual property aspect. I have kept it here intact and unmodified. An essay by The Famous Brett Watson, <famous@nutters.org>. "Things that are true and things that are better are, by their nature, practically always easier to prove and easier to believe in." As anything grows or scales up, its dynamics change. What is true of a two-foot swell, for example, is not necessarily true of a tsunami. The free software community, mostly due to the catalytic effects of Linux distributions and the Internet, has experienced enormous growth in this decade. We've recently reached a kind of "critical mass" where we've broken through into the public consciousness, or at least into the news. More and more non-hackers have heard buzzwords like "Linux" or even "free software". At the same time, this growth has changed the internal dynamics of the free software community. It would be interesting to plot the number of free software projects in operation through this decade, and the number of web sites dedicated to some particular project or free software in general. The software itself isn't everything, though: there's also the proliferation of news and discussion sites related to Linux or free software, and an increase in the number of miscellaneous papers such as the Halloween documents. One of the things which has become increasingly evident is that although the free software community has much common ground in terms of motives, ethics, and software Weltanschauung, there are a number of distinct variations within the theme. In particular, one thing is for sure: although Richard Stallman is widely regarded as the founder of the free software movement, there are substantial differences between what he preaches and what many others believe. The somewhat uneasy relationship between Richard Stallman and Eric Raymond on matters of free software philosophy highlights this quite well, but it is far from the whole story. In this essay, I would like to share some of my perceptions regarding the current state of free software philosophy. In addition to exploring the differences between Richard Stallman's "GNU" and Eric Raymond's "Open Source" approaches, I would like to explore another position which is widely held but has little concrete literature and no evangelist promoting it: defensive or nominal copyright, as embodied in licenses such as the X license. I then discuss the application of these philosophies in the broader context of "intellectual property". Most of this essay will be familiar territory for those who take an interest in philosophical matters relating to free software (and intellectual property), but I believe I raise a number of questions which have been generally overlooked or insufficiently addressed. An implicit assumption of this essay is that free software is a good thing. I do not discuss the benefits of free software versus proprietary software, as I believe the issue has already been well addressed by the people and organisations mentioned in this essay. What I am concentrating on here is the differences between the existing schools of thought which are all in favour of free software, and the implications these schools of thought have on broader intellectual property issues. The aim is to stimulate thought on what each position really means, and I hope the reader will come away with an enhanced awareness of the philosophical issues within the realms of free software. In Homesteading the Noosphere, Eric Raymond introduces the notion of the noosphere as the space of ideas, particularly ideas for computer programs. Hackers homestead this noosphere by actually implementing these ideas in software. Particular hackers become recognised as having title to a part of the noosphere based on the work they have put in to developing software for it. This recognition is what prevents any random upstart from seizing control of the project. But the noosphere isn't just about software-ideas; it also covers other kinds of idea. These other ideas may have different dynamics with regards to homesteading because they aren't expressed as software, but this discussion will be restricted to observing the actual homesteads themselves rather than the dynamics of homesteading. One other such area of the noosphere is free software philosophy, itself a sub-region of intellectual property philosophy. This is quite different from actual software: instead of code we have essays and license agreements. Clearly these are of concern even to those who only write code: the essays explore the topography of the noosphere, and the license agreements are attempts at creating a legal embodiment of a particular philosophy. They might not affect the code directly, but they certainly affect what you can do with it. Consider that part of the noosphere which relates to free software philosophy. Richard Stallman was really the first person to do any concrete homesteading in the form of essays on the matter. As software grew as a commercial enterprise, and the norm shifted to software being closed, secret, and copyrighted, RMS decided he did not like what he saw. With grim determination, he resolved that he would take the opposite path to those who sold their community spirit to impersonal, greedy, and evil corporations. This was to be a moral crusade with the central tenet that software should not have owners. With the GNU manifesto and GPL, RMS explicitly defined new territory in the philosophical noosphere. Here was Copyleft, the newly defined antithesis of Copyright; concepts which formed the left and right edges of a philosophical chasm. This was GNU territory. More recently, Eric Raymond added his comments in the form of The Cathedral and the Bazaar, a paper which explored new territory in the free software philosophy noosphere. The epiphany of this paper was that open development, Linux style, works really well. Not just better than you would have expected, given the chaotic nature of the process, but better than the traditional methods of software engineering. Suddenly, here was a new angle on the whole process: Linux is good because the open development process is superior. This led to a new rationale for free software: whereas RMS insisted on freedom of code for moral reasons, ESR presented the pragmatic concept that it can simply produce a higher quality of code. This region of the noosphere is known as Open Source. Whereas the GNUs have a specific license, the GPL, Open Source describes the acceptable limits of a license without dictating a particular one. But quietly pre-dating both of these rather obvious and well-documented parts of the noosphere is another philosophy. It is broad and passive, has no great advocate, and no famous essays (of which I am aware) on its precepts. This philosophy is embodied in such licenses as the X license. The GNU project refers to this as "non-copyleft free software", which is both long-winded and GPL-centric. In general usage it is often called "BSD-style" licensing, but the BSD license is actually not a great example because it contains the "obnoxious BSD advertising clause", which really does deserve to die. For the purposes of this paper, I adopt the generic term "defensive license" for this class of license. These have the defining characteristic that their terms incorporate no restrictions other than to protect the copyright owner from being sued. Defensive licenses are very close in spirit to pure public domain -- the complete absence of copyright. This narrow band of behaviour, from defensive license to no license at all, I term "unrestricted" for the purposes of this paper, because no attempt is made to restrict what can be done with the software. (Defensive licenses attempt to restrict what you can do to the author, but not the software.) This category of unrestricted software is the quiet achiever: significant packages such as XFree86 and BIND have been released under licenses (or non-licenses) of this type. The GNU and Open Source ideologies are well-defined because they have spokespersons one can quote. The most significant point of difference between these two is that GNU considers it a fundamentally moral issue, whereas Open Source views it in purely pragmatic terms. This dichotomy is brought into sharp relief by the following (admittedly selective) quotes. "Stallman just doesn't care about pragmatic arguments -- he declares he would prefer to use a free software program even if it wasn't the best solution for his needs. Freedom, for Stallman, is a fundamental moral good..."
-- Andrew Leonard, "The Saint of Free Software"
"Either open source is a net win for both producers and consumers on pure self-interest grounds or it is not. If it is, you cannot lose; if it is not, you cannot (and should not) win." -- Eric Raymond, "The Richard Stallman Saga, redux"
The Open Source position seems to allow that there may be situations in which proprietary software is a defensible position: it's purely a question of which system works better. Their advocacy is on the basis that most proprietary systems would be better if they were open. The GNU position, on the other hand, is that the very act of making software closed is evil; greedily hoarding a resource which costs nothing to reproduce and share. This moral versus pragmatic distinction is the cause of much friction between the two. Open Source takes the approach that free software is better and we should therefore choose to make our software free for "self-interest" reasons. 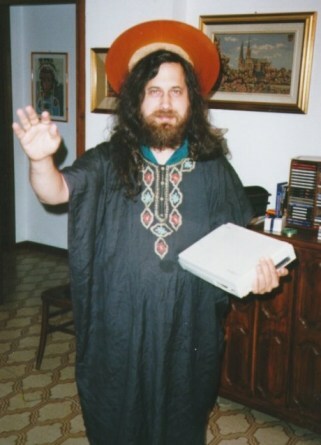 In Stallman's ideal world the current legal situation is reversed, making all software free for the sake of the greater good, even if it isn't in the software author's best interests; the benefit of society at large is deemed more important than the benefit of the author when it's a case of sacrificing one for the other. Proliferation of the GPL is also very much on the GNU agenda, and it's interesting to compare this with Open Source. Eric Raymond is a vocal advocate of Open Source, but there's nothing inherent in the ideology which requires this kind of evangelism. With GNU, on the other hand, the means of proliferation is built right into the license -- the virus-like property of copyleft. The idea is that, confronted with a choice of "use GPL code and release GPL yourself" or "redo from scratch all the GPL code you would have used", some people will choose the former, and the GPL code base will grow. This focus on proliferation also stems from the moral versus pragmatic issue. Open Source views proprietary software as somewhere between sub-optimal and downright ugly, on a case by case basis. It is therefore undesirable to some extent, as is all inefficiency and ugliness. The GNU project views free software as a moral imperative, proprietary software as an intolerable evil. The ultimate GNU goal is to eliminate the blight of proprietary software, or at the very least ensure that there are free alternatives to every proprietary program. Although in essence they both support free software, the ideologies behind GNU and Open Source are markedly different. Despite this, the end result is often very similar: many Open Source licenses are copyleft, especially those which have migrated from the copyright side of the philosophical chasm (like Mozilla). The key difference, I believe, is that whereas GNU sees copyleft as a means of proliferation, Open Source sees it as a means to prevent proprietary competitors from gaining unfair advantage, or from the perspective of individual programmers, a means to prevent proprietarists getting a free ride off their work. The ideologies of those who release under unrestricted terms are not well-documented. No unrestricted software distribution of which I am aware includes an explanation of the rationale for releasing under such terms. I'm an advocate of this class of license, so I've done some research in the form of soul-searching and discussion with other advocates. What is it that attracts me to it? Well, there are pragmatic reasons for it: hackers tend to hate legalism and bureaucracy, so it makes a certain amount of sense either to try to bypass them by disclaiming all copyright, or apply the minimal amount of legalism to keep the rest at bay. This approach to licensing, defensive licensing, has been compared to a dike which holds back the shark-infested waters of litigation from our reclaimed land. The reason a hacker might prefer a defensive license to the GPL in particular can also be explained in these terms: copyleft is an additional restriction which some people might find inconvenient from time to time. Richard Stallman may argue that copyleft won't inconvenience anyone who is acting in the same spirit of generosity, but for those hackers who would rather get on with their job rather than try to change the world, copyleft becomes an additional burden. If you're working on commercial code, then GPL code can't help you. Looking at it another way, copyleft is primarily intended as a means of proliferation, and the absence of such a mechanism in defensive licenses suggests that those who adopt this style of license do not care to impose their ideology on others, possibly because they consider such behaviour impolite or unnecessary. This may also explain the lack of essays on the matter, to some extent. In the ethical and moral plane, it is quite easy to see how hacker logic would produce unrestricted terms rather than copyleft. Hackers often take things to their logical extreme, and unrestricted terms are the logical extreme opposite of proprietarism, more so than the GPL, and are therefore natural for an anti-proprietary stance. "All rights reserved" becomes "all rights waived". Although the GPL actively opposes the ill-effects of copyright, it does so using copyright law. Unrestricted terms are appropriate for people who think the moral opposite of proprietary software is unrestricted software, rather than copyleft software (which deliberately retains certain restrictions). taking a purist anti-copyright stance. It's a significant point that those who use unrestricted terms to express an anti-copyright stance do so in a manner qualitatively different to GNU. GNU isn't strictly anti-copyright, but rather opposed to a certain behaviour -- mean-spirited software licensing -- which copyright is used to enforce. The GPL is an attempt to enforce the opposite behaviour using the same licensing mechanism. An anti-copyrightist will object to the mechanism itself, rather than the behaviour any particular party uses it to enforce. This point of differentiation between the GNU and unrestricted philosophies deserves further examination in terms of ethics. As Open Source is driven by pragmatism, not ethics, it may take a back seat for the moment. Before shelving it, though, I will mention that some people consider pragmatism itself to be an ethical stance: that is, we are morally obliged to do that which produces the best outcome. In some circumstances this may mean free software, and in others it may mean proprietary software; the net result of each case is the only means by which judgement can be passed. Such a "pragmatic morality" lacks the ability to guide us, however: we would have to know the outcome of every possible course of action in advance for it to do so. The hope of idealism, on the other hand, is that if we get our principles right, right results will follow. It is an interesting question whether copyleft or unrestricted terms produce better results from a pragmatic standpoint, but as the subject of this essay is philosophy, it is beyond our current scope. GNU takes the approach that freedom is necessary, a fundamental good, and uses the GPL as a weapon to bring it about. The GNU stance is a militant one, deliberately exclusivist, intent on being an agent of change -- not exactly by force, but by pressure and assimilation. You may participate in GPL software only under the terms of the GPL, which include making any additions and alterations GPL also. Potentially interested contributors are given a choice: do it our way, or buzz off. Stallman calls this "pragmatic idealism". If I understand him correctly, he means to say that copyleft is a set of ethical ideals with teeth: the GPL is a tool designed to cause the propagation of GNU ideals. Stallman has no qualms with co-opting copyright in the fight against proprietarism. He firmly believes that the self-confessed "fight fire with fire" nature of the GPL is necessary to the cause of free software. Also, although it is an added legal burden in a situation where we probably want less law, not more, it is fine-tuned to inconvenience only those engaging in the kind of behaviour the GNU project wishes to eradicate. Although Stallman believes that copyright as a mechanism lends itself to evil purposes much more readily than to good, it's important to stress that the GNU project's fundamental argument is not about copyrighted software, but proprietary software. The GNU position is that we should not only be allowed to copy software freely, but that we should also have free access to the source code, so that it is possible for us to "read, fix, adapt, and improve, not just operate" the software. The GPL's requirement that all source code be made available is a legal embodiment of Stallman's moral stance: that software authors should be required to make their source code available to the same extent that they make the object code available. This is an issue of secrecy which is entirely outside the scope of copyright in its current form: source code to proprietary software is generally unavailable because it is undisclosed, not because it is copyrighted. From the GNU perspective, eliminating copyright on software would reduce but not eliminate or even minimise the inherent evil of proprietary software, whereas it would render the GPL effectively toothless. I would assume that many people writing software under unrestricted terms disagree on ethical grounds with the use of copyleft. It's also possible to differ for pragmatic reasons: for example, one might take the view that the quality of the development process itself is sufficient to marginalise any attempts by commercial competitors to co-opt the software. Any such commercial competitor will start with the same code base but lack experience in the code, and they will not have the advantages of the bazaar mode of development. The competitor is doomed to play catch-up against the free project, and the free project can co-opt the ideas of the commercial. The odds are already so loaded in favour of the free project that copyleft becomes extraneous legal baggage, and combative behaviour towards the commercial enterprise is pointless. But in terms of purely ethical considerations, one may differ from Stallman's position by objecting only to the aspect of copyright. If one takes the stance that copyright is evil, the GPL's fighting of fire with fire translates to fighting evil with evil. If copyright is evil, the logical action is to renounce it, not co-opt it. Under such an ethic, the special privileges granted by copyright should be waived, not employed to a different end. This treats the question of secrecy as an independent issue, whereas the GNU philosophy considers copyright and nondisclosure as facets of the true problem, proprietarism. An anti-copyright stance such as this views it as unethical to prohibit others from sharing at no direct expense to the original author, but still allows the author the right to decide how much he personally is going to disclose. Conversely, whereas the GNU philosophy considers it morally unacceptable to withhold source code, this alternative ethic may consider it morally unacceptable to demand disclosure of source code, even where such disclosure is considered better for society on the whole. This ethic assumes a natural right for people to be selfish and uncooperative: it neither aids or prohibits that selfishness, whereas copyright aids it, and copyleft would prohibit it. Even if one views copyright in neutral terms, as a tool to be used to either good or evil ends, there is still an ethical question of coercion. This is the question of whether we should use legal means to oblige others to act in the manner we deem morally correct. Copyleft is an example of a coercive system, and unrestricted licenses an example of a non-coercive system. One might adopt a coercive scheme because one wishes to be an agent of change, as is the case with Richard Stallman. On the other hand, one may employ coercion to assert one's individual rights, without necessarily trying to change anyone else's convictions. Advocates of a non-coercive system may themselves dislike being coerced, and by application of "the golden rule" hence refrain from coercing others. Similarly, one may take the view that coercion is unethical, either in general, or in these specific circumstances. These alternatives form a kind of spectrum, the various bands of which I will now explore in greater detail. Linus Torvalds is known to take this less militant stance: an author may dictate the license terms for his work, and everyone else can accept those terms or write their own program. Not only does this stance allow people to be selfish and uncooperative, it even recognises copyright as a legitimate means of enforcing it (or the opposite behaviour). Even so, adherents of this ethic may (unlike Stallman) consider the abolition of copyright on software a net win: copyleftists would lose the power to access modified source code, but proprietarists would lose the power to charge for every copy of the software. As is, proprietarists don't contribute much code to free software anyhow, so copyleftists wouldn't lose much, but proprietarists would suddenly lose vast amounts of revenue and control. That's a pragmatic assessment, but it works in terms of ethical considerations also. The "mutually friendly" ethic has a strong egalitarian bent: most things are acceptable so long as nobody obtains an unfair advantage. If copyright exists, then at least we have the ability to use it to our own ends; if it does not, then it can't be used against us. Software patents are probably more offensive than copyright in this ethic, because even performing exactly the same research is not sufficient to bypass the monopoly of the patent. There are also a number of ethical stances one could take which suggest a non-coercive approach such as a defensive license. One stance is to recognise the rights offered by copyright as legitimate, but personally waive them as a public service, either in general or on a case by case basis. Another stance is to regard the copyrighting of software as unethical without wishing to impose your own code of ethics on others. Even if waiving copyright is morally the right choice, it does not automatically follow that coercing others into the same behaviour is also morally right. And even if one believes the law should be changed to remove copyright protection from software, it does not follow that one should attempt to enforce a form of "private law" in the terms of a copyright license! After all, there may be other things of which you do not approve -- should you also attempt to incorporate prohibitions on all those things in your software license? When writing a software license, the whole question of software licensing may be the foremost moral issue in your mind, but there's no particular reason to single it out and incorporate it into the language of the license. It is arguably more consistent to include all your moral stances or none of them, rather than your "favourite" moral issue or issues. If it's all or nothing, then nothing is obviously a far better choice, especially since you may be wrong about various moral issues. Applying reductio ad absurdum to the incorporation of moral issues would result in a license summarisable by the phrase, "you may do whatever you like with this software, so long as it is compatible with my moral views, whatever they happen to be at the time". Although I would suggest that arbitrary incorporation of moral issues into a software license is a dubious practice, I would argue that Richard Stallman is fair and reasonable when he singles out the moral issue of copyleft. Copyleft is his root cause, and the GPL was designed to be a vehicle for the proliferation of that cause. He didn't just write a software license and throw in copyleft as an afterthought: the GNU ideals are the raison d'être of the license. It also happens that this particular morality is, it seems, ideally suited to proliferation by means of a software license; it's hard to imagine, say, conditions related to an anti-abortion or anti-nuke stance being similarly effective. This is partly because copyleft is a scheme that many people employ for other reasons, without necessarily believing that it is the only morally correct license; and partly because the copyleft restriction applies to what you can do with the code, rather than what you can do with the program -- a subtle, but important distinction. You'll note that the terms of the GPL don't prohibit the program from being used in any particular way, even in the creation of proprietary software. For example, there's nothing in the license which prevents a Microsoft programmer from hacking proprietary Windows code using Emacs. The anti-proprietary aspect of the GPL comes only from the fact that derived works must be released under the same license, and the license requires source availability. To prohibit just about any other group, you would have to name them or their field directly, and the law might not even grant you the authority to discriminate in such a manner. With proprietarists, requiring redistribution of source under the same license is sufficient to foil them. The GPL is an elegant weapon in that regard. Richard is also active for this cause in a number of other ways, including proselytising in person as an invited speaker. Perhaps his adamant moral stance and his "Saint IGNUcius" act combine to give some the impression that he actually views himself as a saint. He does not: the Saint IGNUcius thing is intended to be self-parody. Stallman's serious intention is not to be holy, but to be an agent of change. "My serious intention is to be a freedom fighter, a "crusader" for the freedom to share. That's what copyleft is designed to do." Perhaps a knight would be a better self-parody than a saint: "Brave Sir IGNUcius, Valiant Crusader of Copyleft". My point is that one should make a serious decision about whether one wishes to be a crusader for the cause before incorporating moral imperatives into a software license. If you apply copyleft to your software because of its moral correctness, as Richard does, you have effectively joined his crusade. Conversely, if you believe in sharing as a good and right thing to do but dislike the notion of being a crusader, an unrestricted license may be more appropriate to your position. You can also GPL your programs without being a crusader: it is a legitimate weapon to use in a defensive mode, protecting your own perceived "rights" in a manner similar to (but vastly more generous than) copyright. Copyleft is a sword -- it's a question of what you are using it to fight, and why. "bsdware is only encumbered in that the copyright statements cannot be removed, and the copyright holder cannot be sued. that's minimal. gnuware is encumbered up the wazoo compared to that. i just wish they wouldn't call it "free."" Stallman says that without copyleft, middlemen would be in a position to "strip off the freedom", but there is an obvious shortcoming in that argument: taking a piece of free software and making a proprietary one based on it does not eliminate the original free software, so how has freedom been reduced? If people, given a choice of free and proprietary, choose to use the proprietary option, they are exercising their freedom of choice in the matter. Can we oppose this and still claim to be pro-freedom? Who is right here? It depends on how you define freedom. The GNU philosophy tries to grant freedom whilst taking away those freedoms which would allow you to interfere with the freedom of others -- meta-freedoms, if you like. This means that certain guarantees can be placed on freedom, but at the expense of losing the meta-freedoms. It's important to note that the GNU philosophy includes a right of access to source code as one of the fundamental freedoms, so a right to secrecy is not recognised as far as source code is concerned: this is one of those meta-freedoms which GNU removes. Note that you are allowed to keep a program completely secret by not sharing it at all, but releasing object code nullifies your right to keep its source secret -- a strict case of both or neither. If you are allowed to withhold the source to your program, then you are effectively allowed to prevent people from reading, fixing, adapting, and improving your program. The author's freedom to keep his source secret is weighed against the freedom of everyone else to read, fix, adapt, and improve it, and the scales come down in favour of the majority. The harm done by withholding source far exceeds the benefits of maintaining secrecy when the impact on everyone involved is considered. In order to guarantee the more preferable of these two possibilities, the GNU philosophy dictates that we should sacrifice the former in favour of the latter, as more people gain more freedom in that scenario. The harmful meta-freedom is outlawed and freedom is maximised. I can understand how some might regard this regimented sharing as akin to communism, but one should bear in mind that copyright can be viewed as a form of regimented selfishness in exactly the same way. Which is worse? Unrestricted licenses do not interfere with any freedoms at all, but neither can they make any guarantees that the parties granted freedom will return the favour. This scheme has the advantage that it is basically enforced by the laws of nature. Whereas both copyright and copyleft require special laws and a means of enforcement to be meaningful, the unrestricted approach is basically an affirmation of the physical world. In the absence of laws mandating otherwise, we can make unlimited copies of software and use them in any way and extent we see fit. We can also create derived works from other people's software and decide whether we are going to share them or not, and whether we will limit that sharing to binary only. Although this makes unrestricted licenses very cheap to enforce, it does not tell us whether they are morally right: the laws of nature also allow us to kill people, for example, but that doesn't automatically make the action morally acceptable. The truly significant aspect of this is that unrestricted licenses grant us the freedom to choose between good and evil. Whereas GNU mandates the greater good, unrestricted licenses introduce uncertainty by allowing individual choice. Let us reconsider the tradeoff involved in mandating source code availability in light of this: on one side we have the author's right to source code secrecy and his right to choose between good and evil, and on the other we have the right of everyone else to access the code. Recognising freedom of choice as an element in the equation makes the decision much thornier. Freedom can only be truly maximised when people retain their meta-freedoms, but nobly elect not to impede others by exercising them. The GNU approach guarantees something short of complete freedom because it eliminates the meta-freedoms. The unrestricted approach allows complete freedom for individual works of software, but can make no guarantee the freedom will proliferate, even to derived works. Which is preferable? I prefer the unrestricted approach, because it has the scope to allow the best outcome (in which all software is completely free), even if it won't happen in practice. Those who are more pragmatic about their freedom may prefer the guarantee offered by copyleft, based on the perfectly credible assumption that people will interfere with each other's freedoms given half a chance, and law is the only remedy. The guarantee of copyleft also prevents a certain amount of injustice: it seems unfair that free software could be appropriated to make a derived proprietary work without the authors of the original work seeing any of the benefits, and copyleft prevents this. But if one recognises the freedom to choose between good and evil as important, one should learn to expect injustice from time to time, just as the right to bear arms means that people will be shot from time to time. Further, it is more important to do good than to be well done by. Is it preferable, then, to enforce a certain level of freedom with law, or to allow individuals the scope to do good or evil and rely on whatever justice is built into the fabric of the universe? You decide. If we consider the broader philosophical region of intellectual property rights, there is a surprising lack of discussion in the free software community. Relative to the high-density area of free software philosophy, very few people have homesteaded themselves a slice of this area. In fact, there seems to have been an implicit assumption among many that software is a special case, and that other areas of copyright are fair game. For example, how many of you thought that you could write free software and make money off manuals until RMS popped by and said restrictive copyrighting of documentation is evil too? This is still treating software as a special case; it just so happens that RMS includes the documentation in his definition of software. But where do you draw the line? What quality, precisely, distinguishes those things which are fair to restrict (if any) from those that aren't? At the risk of overdoing the metaphor, this area of the noosphere seems to be terra nullius. I have been particularly puzzled by this. Can software be justly considered a special case? Writing this essay has given me further pause to ponder this matter, and I have come up with the following concepts. "All our reasoning ends in surrender to feeling." For starters, software can be considered a special case inasmuch as it forms a unique nexus between the intangible world of abstract concepts and the concrete world of machinery. This peculiarity goes beyond the fact that it is functional rather than aesthetic. A work of fiction, such as a novel, is primarily an artistic work, intended to be evocative; a non-fiction work, such as a manual, is primarily functional, intended to instruct. Software is more than just "functional" because not only is it descriptive of a process, it is the process. One can "ad lib" a bit in following instructions on how to cook something without re-writing the recipe, but it is impossible to change the function of a program (beyond its inherent bounds) without changing the program text. Whereas most functional texts are acted upon by a human being, capable of both judgement (good or bad) and improvisation, software is acted upon by a machine which can do neither. To vary the process at all, one must alter the program. Alas, although this is an interesting property, it doesn't really tell us whether or not intellectual property rights should or should not be applied to software or anything else. It does, however, serve to warn us of the implications of proprietary software compared to, say, a copyrighted novel. The main issue is the aspect of modification: immutable software can be a problem; an immutable novel barely matters. This problem is compounded by functional dependence: one can come to rely on software to get an important job done, which means in part that task can be influenced or used as leverage by the owner of the software. This is significant, because the software owner has a measure of influence over a process which is probably none of its business! Note that functional texts in the form of instructions to humans have no such problem. Even if a procedural manual may not be modified, it is always possible to make a supplementary manual which describes the necessary differences. Having a supplementary manual (or manuals) might be inconvenient, but at least it's possible. In software, supplements are called "patches", but only the copyright owner is in a position to supply them as a result of legal and practical restrictions. This is another peculiarity of software compared to other functional texts: it exists in two forms, source and object, and the licensee is normally granted access only to the object form. The object form is directly machine executable, but its exact workings cannot be properly understood by a programmer without recourse to the original source or a decompiled version of the object. Given that the original source is typically a secret, and decompilation is prohibited under the license terms, software manages to occupy the bizarre position of being both copyrighted and secret! A company would be very suspicious of an external entity which wanted to have exacting and secret control over their internal procedures, but when it comes to doing it in software, people accept it unquestioningly. Another reason why software might be considered special is its facility to be improved by bazaar mode development, but this isn't necessarily as special as one might think. Whilst it's true that works of art are individual creative expressions by the author, it is also true that better art can arise from the facility to adopt the ideas of other artists without restriction. By adopting parts of another artist's work, you are not modifying their work so much as creating a new work derived from theirs, so arguments suggesting that derived works misrepresent the original artist aren't valid in the general sense. Ram Samudrala suggests that the dynamics of bazaar mode development apply just as well to writing music, and predicts that there will be a battle between the established copyright-based system and the creative efforts of a community of musicians freely exchanging ideas and music: another cathedral and bazaar scenario. The question of whether software is special is a tricky one. In many regards, software is special. It is super-functional, and manages to be both copyrighted and secret (a feat which no other copyrighted work I can think of attains). These facts don't make for a completely compelling argument in any particular direction with regards to copyright, however. It may be argued, for example, that software should be allowed only one of copyright and secrecy, not both, but such a position is not the only reasonable one. My main reason for asking whether software is special is so that we may broaden the philosophical considerations to areas other than software: if software is not special, then it is logical to be opposed to copyright in general rather than copyright on software (if one is indeed opposed to copyright on software, which is not true of all free software advocates). Alas, the area is sufficiently grey that no one position seems to be the inarguably correct stance. In the absence of a definitive answer, one should still attempt to maintain consistency, however. I have opted, personally, to view software as different in an interesting way, but not inherently special in terms of its application to intellectual property laws. I therefore apply my own stance across the board to all copyrightable works, which is why I have waived copyright on this essay. Others may opt to consider software a special case with regards to intellectual property rights. As far as I can tell, we have little choice but to "surrender to feeling" in passing judgement on this issue. Given the unhelpful non-answer I have given regarding the specialness of software, why not look at the actual stance taken on this matter by the various organisations and essayists to which I have referred? An investigation of those organisations reveals that they are just as unhelpful in the general case. According to the Open Source FAQ, the Open Source Initiative (OSI) has no official position on "intellectual property rights" in general. Extrapolating their summary dismissal of the issue based on what I understand of the pragmatic case for free software, I would say they aren't really opposed to copyright on software anyhow, so there's no particular reason to oppose copyright on other works. It has not been vividly demonstrated that novels, movies, and music would gain any benefit from being freely modifiable and distributable the way software does: there is no obvious parallel to Linux as an exemplar in these areas. In any case, the focus of Open Source is on making better software, not eliminating copyright or moralising. OSI would not necessarily be interested even if open source principles were helpful to other endeavours, except that it would form further "proof of concept". I'd suggest they should very much look into software patents, however, since they have the potential to impede or undermine free software. Their non-position on patents is understandable in the context that they are both relatively new and market-oriented: they don't have a position yet, and they should develop a good pragmatic argument for their case one way or the other before they do. Eric Raymond's personal position on IPR is in keeping with my speculations here: he is not opposed to IPR as such, but does consider patent law to have been badly applied in the case of software. The Free Software Foundation (FSF) is also a software-specific organisation, so we shouldn't automatically assume that there is any official GNU position on any non-software issue. They are, however, opposed to software patents. In explaining why there are no GIF files on GNU web pages, the author states, "the LZW patents--and software patents in general--are an offense against the freedom of programmers generally". The GNU web pages do not talk about software patents in much detail, however. Instead, they concentrate mainly on the copyright (or copyleft) issue, and refer to the League for Programming Freedom on matters of software patents. Despite their scant treatment of the issue (apart from the GIF aspect), I'd say it's fair to include "opposition to software patents" as part of the GNU philosophy based on the quotation damning software patents, their referral to the LPF, and the fact that RMS is himself an active proponent of the LPF. Unlike the OSI, the FSF does actually make an argument for software as a special case with regards to IPR. Consider the following quote. "The case of programs today is very different from that of books a hundred years ago. The fact that the easiest way to copy a program is from one neighbor to another, the fact that a program has both source code and object code which are distinct, and the fact that a program is used rather than read and enjoyed, combine to create a situation in which a person who enforces a copyright is harming society as a whole both materially and spiritually; in which a person should not do so regardless of whether the law enables him to." -- Richard Stallman, "The GNU Manifesto"
Unfortunately, Richard's rationale here is substantially what I mentioned and then rejected as uncompelling in the previous section. There's not actually any falsehood in Richard's statement, but it boils down to opinion. He claims that the duplicability, duality (source and object), and functionality of software combine to tip the ethical balance in favour of "no copyright". As I've pointed out, these are good and interesting reasons, but they don't form a compelling logical argument. One can agree with all his points but still disagree with the conclusion. The lack of a strict logical argument is probably unavoidable, but there is a more significant problem with this line of reasoning. The problem is that things other than software also fit his argument to some extent, which undermines the whole point that software is special. Consider music for example. It is frequently distributed in forms which are easily duplicated from person to person, especially now with the advent of the MP3 format. Although it does not have a strict "source" and "object" form, the final recording (on CD, tape, or MP3) is a "compiled" form which is suitable for distribution and is derived from sources (multitrack recordings, sound samples, MIDI files) which are much more appropriate if you wish to modify or re-use portions of the work. Finally, although music is typically viewed as "aesthetic" rather than "functional", there are plenty of instances where music is functional and therefore would be useful to modify. Take the instance of a dancer who wishes to perform to a piece but requires a slightly faster tempo, or a maker of a documentary who wishes to include some music (minus the vocals) as background to some of his pictures and narrative. I don't believe I'm constructing a very compelling argument for free music here, but I do believe Richard's argument is similarly flawed. The case of software is certainly more severe than music, I grant, but it then becomes a matter of degree, and we must choose an arbitrary cut-off point. In ethical terms, if it's bad to hoard software, is it also bad to hoard other things, and where is the line drawn? MP3 files can be shared just as easily as software, but they are meant to be enjoyed, not employed; is this distinction sufficient to make it unethical to share? Aren't computer games and fancy screen savers also meant to be enjoyed? Treating software as a special case involves many such cans of worms. Ironically, given my line of argument here, Ram Samudrala suggests free music is a reasonable extension of the GNU philosophy, and goes so far as to suggest that all copyrightable and patentable information should be free, which is exactly the kind of generalisation we seek. The argument is reasonable enough: it should be because it can be, and it would be of generally greater benefit; but once again, as with Stallman's argument, this comes ultimately as a matter of opinion rather than irrefutable logic. Samudrala's argument has the practical benefit that it's a logical extreme, devoid of special case issues. That in itself doesn't make the position correct, of course. The GNU philosophical essays do occasionally venture into IPR issues broader than straight software, but not in a tremendously direct and decisive manner. They hint at rules for broader issues without being substantial enough to describe a philosophy. Consider the following quote. "As a general rule, I don't believe that it is essential for people to have permission to modify all sorts of articles and books. The issues for writings are not necessarily the same as those for software. For example, I don't think you or I are obliged to give permission to modify articles like this one, which describe our actions and our views." So restricting modification is not necessarily evil when it comes to "articles and books"? Or does he just mean that we aren't obliged to let others misrepresent us? Alas, no mention of restricting verbatim duplication. Even Stallman's story on "The Right to Read" does not address the issue directly, despite being about IPR issues other than software. It extrapolates a dystopian future from our current position and acts as a warning about current trends, but offers no comment on the status quo. On the other hand, his paper "Reevaluating Copyright: The Public Must Prevail" makes the point that the US constitution expresses copyright as permission to create laws which temporarily overrule the public's natural right to make copies of things, and emphasises that this permission should only be used in as much as it actually benefits the public. Thus, if the public prefers to make copies of some class of work, even with the understanding that it may result in less original work being produced in that field because of reduced incentive, then copyright protection on that class of work should by all means be withdrawn. This is a wonderfully clear and practical argument, and it applies to copyright generally without singling out special cases. Unfortunately, it gives us no clue as to whether this is a moral imperative like the software issue or just a matter of preference, because, most unusually for Stallman, it is devoid of moral assertions. The reason for this is obvious: it was published in Oregon Law Review -- need I say more? Alas, we still lack a complete chain of reasoning from Richard Stallman on the broad IPR issue. On the one hand, the GNU project takes the stance that copyrights and patents on software are morally intolerable, and the rationale for that conclusion would seem to apply to things other than software, yet GNU elects to treat software as a special case. When it comes to the broader issues, Stallman always seems to lean towards the side of the right to copy, but with nowhere near the intensity and ferocity he states his position on software. Is he just holding off on the other issues until he breaks through on the software front, or is there a real moral difference separating software from everything else? In passing, I would also question a possible implication of the above Stallman quote: the suggestion that copyright can or should be used to preserve the integrity of one's comments. I am no lawyer, but does this require copyright at all? If someone attributes a comment to you which misrepresents your position, can't that be classified as defamation or libel, and would it not be better to prosecute it as such? Strong preservation of integrity is more effectively done in software anyhow -- that's what digital signatures are for. Copyright offers no such preventative measure of protection, and if legal protection against misrepresentation can be obtained by other laws, we shouldn't complicate matters by introducing it as an aspect of copyright. There is a striking lack of discussion from the usual leaders with regards to the application of copyright in areas other than software. Raymond is mute, and Stallman mumbles. They both seem to view software as a special case: Raymond tacitly, and Stallman explicitly. Ram Samudrala, on the other hand, makes no such distinction. The question of software as a special case remains unresolved (and probably unresolvable) in my opinion. We are left to ponder for ourselves whether we should apply our free software attitudes to other works as well. Even Ram Samudrala's "Copying Primer" essay (opposing copyrights and patents) does not express the most extreme possible position, because Trademarks also fall into the category of intellectual property. Patents, Copyright, and Trademarks are the IPR triumvirate. (Actually, trade secrets can be considered a fourth kind, but they are somewhat different beasts because, unlike the other three, they do not involve a monopoly being granted on some idea, word, symbol, or process. I don't mention them further.) Trademarks are the most innocuous element, the "third twin" that everyone forgets, but if one is to have a complete philosophy of intellectual property, it must encompass trademarks as well as patents and copyright. This is another question of special cases: if you are opposed to intellectual property rights in general, do trademarks constitute a sufficiently special case that they are acceptable, or not? I would far rather point this entire argument off to a good essay somewhere else, but since I know of none, I will provide an introductory discussion of the matter here myself. It may be advisable to skip this section if you aren't interested in forming an excruciatingly uniform approach to intellectual property rights. The purpose of trademarks, ostensibly, is to preserve identity. For example, when you buy a Sony monitor for your computer, you expect a certain quality behind the name. Trademark exists to prevent other companies co-opting Sony's name and recognised symbols in order to deceive consumers. Some countries are notorious for not enforcing trademark law, and they are rife with "brand pirates" who sell cheap imitations. I have a cheap imitation Rolex watch that a friend gave me as a gift. Fortunately, both he and I knew what we were getting -- a cheap imitation and not a watch made by the owner of the Rolex trademark. Trademarks, put simply, grant a company a limited monopoly on the use of certain words and symbols so that they may be used as marks of authenticity. What possible objection can one have to a scheme designed to protect consumers from trickery and misrepresentation? Well, if it only did that, there would be no problem. The devil, as they say, is in the detail. One problem with trademark law, as typically implemented, is the aspect of "dilution". For example, what if someone wants to sell tee-shirts with a trademark of a car company or alcoholic beverage on them? This would not constitute misrepresentation, because the trademark is for something other than the clothing. Nobody would assume that the clothing was made by the car or beverage manufacturer. Nevertheless, this is generally not allowed without the permission of the trademark owner, because it ostensibly "dilutes" the value of the trademark. That a trademark somehow has inherent value which can be diluted in this way reveals a problem. Trademarks aren't supposed to be about value, but about authenticity. Any value that springs from a trademark should result from public perception that the trademark owner creates a good product. If this were the actual practice, there would be no problem with clothing manufacturers placing trademarks on tee-shirts as decorations -- it would be free advertising (unless it was the trademark of a clothing manufacturer, which would be misleading). In actual practice, however, trademarks themselves become direct sources of revenue rather than authenticating marks. The car or beverage manufacturer with a well-liked product can regulate the use of their trademark on items of clothing, perhaps at a fee. Trademark owners can also exercise a certain amount of control over critical speech which includes their trademarks. This includes cases where the trademarks are being used by some third party to identify the company in question without misrepresenting them; the use of the trademark is often disallowed anyhow -- a form of corporate censorship. (In the US, the use of trademarks in parody has been allowed as "free speech" by the courts, but in many other cases the trademark owner is effectively allowed to censor the speech.) This brand of censorship is absolutely rife on the Internet, where trademark owners routinely try to stamp out any web site utilising their trademarks, with varying degrees of success. Surprisingly, grass-roots fan sites are typically the first to come under fire and receive threatening letters from legal departments demanding the site owner "cease and desist" from their unauthorised use of valuable intellectual property, although less complimentary sites are popular targets too, of course. Another aspect, the application of "dilution" rules to domain names such as ajax.org, is familiar to most free software advocates. Ultimately, a brand name or trademark can become such a success that it is actually worth more than the product itself. Under these circumstances, it becomes a business of selling an image or identity rather than a product. To do a mental check of this, next time you're walking through a shop of some kind, consider how it would affect the value of each product if all its trademarks were removed. Little impact means that you value the product; large impact means you value the image. Alternatively, imagine you could get an inferior but cheaper product with the trademarks on it -- how would that affect its value? For example, if you had a pair of trendy-looking but brandless athletic shoes, what are they worth? How much are they worth if you add the "Nike" logo? How about a pair of unbranded jeans versus the same pair with the "Levi's" logo? If you, like most hackers, do in fact concentrate on product rather than image in most cases, then consider how all the above might affect others. Many products have earned their reputation deservedly, and trademarks offer them fair and legitimate protection, but other companies are in the business of manufacturing "image". It seems to me to be harmful to have so much time, effort, and money spent on something which does not provide any lasting contribution to society. In fact, it is money spent creating an artificial need rather than supplying a real one. Advertising becomes a massive education campaign to promote mindless consumerism. There may be some economic argument why this kind of artificial demand creation is a good thing, but if so, it defies common sense. More money is flowing around, but we have nothing more to show for it. Is this a price we pay for the monopoly granted by trademarks: the ability of companies to inflate the value of an otherwise ordinary product by the application of masses of advertising hype? Can the desirable aim of authentication be achieved by means other than trademark law? If we forego individual words and symbols as a legal means of identification, the answer is yes; there are laws to protect consumers from this kind of fraud independently of trademarks. Microsoft, probably because of the piracy problems in certain countries, issues "certificates of authenticity" with its products. Unauthorised duplication of one of these certificates is not merely a breach of trademark law, but outright fraud. The certificate makes the claim that the software "is legally licensed from Microsoft Corporation", and this claim is either true or false regardless of trademarks. This "certification" could as easily be used by car manufacturers -- in fact, such certificates are common practice where trademarks aren't appropriate, such as works of art or collector's items. For the purposes of retail sale, a strict "certificate" is not necessary -- any written claim regarding the identity of the manufacturer will do, be it on the product packaging, the product itself, or a document attached to or sold with the product. Note that in Microsoft's case, piracy continues pretty much unabated regardless of the certificate of authenticity. My point is not that certification prevents piracy (it doesn't), but that the example instance of copying would still be illegal in the absence of all intellectual property laws because it involves a fraudulent claim. The goal of authentication can be achieved without recourse to trademarks. The broader implications of this matter are beyond the scope of an introductory argument such as this. If trademarks were abolished, would marketers attempt to inflate corporate images in the same way that brands and trademarks are inflated now? What impact would it have on advertising techniques? These are questions for someone who is willing to spend more time researching the matter than I. For the purposes of this paper, I believe it is sufficient to conclude that one may personally abstain from enforcing a trademark without forgoing product authenticity. Even if the product can't be authenticated by a digital signature, it is possible to provide legal assurance of authenticity without recourse to trademarks. I think we would probably live much simpler lives if the notions of "Copyright" and "Intellectual Property" in general had never been invented. Were that the case, we'd probably have a few crackpots who were resentful about the fact that everybody else could use their creations of art, literature, and invention without asking permission or paying tribute. Everyone else would think them odd for wanting such control over the forces of nature. Alas, Pandora's box is open, and we are left in a position where we must decide whether these things are good, evil, or neutral, and why. We must do this, that is, if we want to have a consistent and well-reasoned approach to the matter. In considering this issue, there are several fairly independent factors one must consider. One is whether software counts as a special case for any reason. Can copyright, for example, be applied uniformly to the entire realm of ideas, or do we have to break it up into special cases? If so, what are those cases, and why are they special? What is the rationale for copyright in each case? Another factor to consider is whether copyright and other IPRs are morally wrong in themselves, or whether it is a question of how they are used. Do we then combat them by attempting to beat them at their own game, or do we renounce them? Alternately, one could deny that a moral issue exists, and focus instead on optimising something. If so, one must bear in mind the main problem of such a pragmatic goals: you have no guide as to which course of action is the optimal one you seek. Another question is whether as an idealist you want to be a crusader for your ideals, or live by them without trying to impose them on others. As a pragmatist, do you dare try the unrestricted path as a source of possibly better results, or do you play it safe and fend off proprietary competitors with copyleft? Can your position on copyright be applied consistently to other IPRs like patents and trademarks? And ultimately, whether we take a moral or pragmatic view, do we cause ourselves more pain with intellectual property rights than we prevent? If philosophy is more about questions than answers, this is plenty philosophical enough. Although I believe that there's probably one absolutely right answer to all of this, there's no way to prove that, or prove which one it is even if that's so. This conclusion will be most unsatisfactory to those who were hoping for a definite direction, but hackers are problem-solvers, and I don't need to dish up canned answers to this intended audience. The best we, as individuals, can do, is to listen to our conscience, and make sure our actions and beliefs are consistent. There will always be a certain amount of dissent, particularly on the copyleft versus unrestricted terms issue, and whether proprietarism is ever tolerable. Such disagreement is unavoidable. I hope a little recognition of our own basic assumptions will go a long way in keeping the various facets of the free software community on an even keel. After all, it would be dreadful if the two foot swell of free software grew into a tsunami only to then break up from the turbulence of infighting. If there's one goal we do all share, I believe it's to make the world of computing a better place, and unlike Microsoft, we don't see that as a process of eradicating the alternatives, but rather a creative process. So let's not get too uptight about finer details when the overall process is heading in the right direction. As Shakespeare said, "this above all: to thine own self be true," for as we lack the means to determine what is absolutely right and wrong in this matter, it will serve us better to nitpick our own philosophy than that of those who have other ideas. IPRs: the author waives all rights and restrictions on this work to which he is specifically entitled by copyright law. Other works quoted in this document retain their original copyrights, and are included here only on a "fair use" basis. "Open Source" is a trademark of the Open Source Initiative. All other trademarks mentioned are the property of their respective holders -- a tautology, really, but standard legalese as far as I can tell. Acknowledgements: the author wishes to thank those people who contributed to this document by means of proof-reading and peer review.